Couperose is a condition where redness appears due to the presence of small, dilated red blood vessels visible on the face; often on the cheeks, nose and forehead. It is common on aging and lighter skin. Couperose is benign, but may be concerning to you, if it’s noticeable. The small blood vessels can easily be treated by laser therapy. Couperose is caused by both external and genetic factors. Often people with weak elasticity of the capillary walls of their skin develop the condition, however age, smoking, sun exposure and extreme temperature changes are also risk factors. Treatment takes 20-30 minutes. Often 1 treatment suffices. Sometimes 2 or 3 treatments are required, with intervals of a month, as skin renewal takes 30 days. Laser treatment can be a little uncomfortable; absorption of the light energy feels like a small rubber band flicking your skin. Due to the light energy the inner walls of the blood vessels are damaged. The blood in the vessels coagulates and the vascular walls stick together, so no blood flow is possible. The blood vessels are then reduced and broken down by your body. 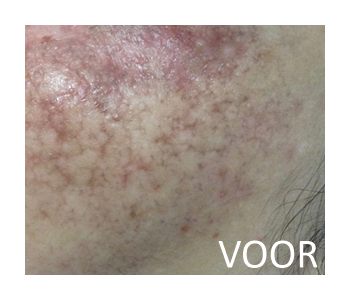 During and after treatment your skin may feel warm and the treated veins will appear darker. The skin irritation varies per person, but will often disappear within 48 hours. 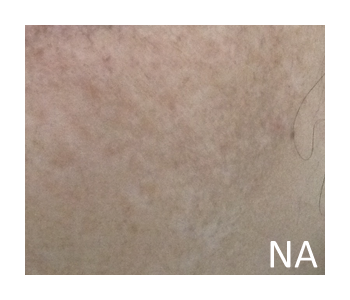 The darkened veins usually lighten up in a few days. We advise to avoid sauna visits, hot showers and harsh sunlight to prevent any further reduction in blood flow. Prices are €65.00 for 20 minutes and €85.00 for 30 minutes.